Owned and operated by Nigel and Lorraine Walker, Eatwell Farm started selling at the Ferry Plaza Farmers Market on day one and has remained at the market for the last 20 years. You can find their stand at the Saturday market. This year, Eatwell Farm, based in Dixon, also celebrates its 20th anniversary. 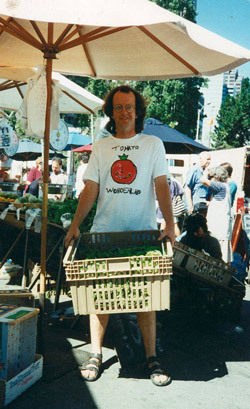 That first Ferry Plaza Farmers Market 20 years ago was a very quiet affair, which was troubling to many farmers. It took five weeks before it really started to buzz. In hindsight, the Saturday routine of customers coming to the market took a while to establish. But in a very short time a community started to form. We were all crammed between concrete barriers in the middle of the Embarcadero where the freeway once stood. There was room for just 70 farmers, compared to the 115+ at the market now. Kelvin went through the market announcing the meter maid’s arrival. There was a sudden rush back to the parking at either end of the market to feed meters. For $5, he would feed your meter when needed. We came to know many of the regular customers, and they knew us and our families. Our families and friendship grew together. We lost customers and friends, too, as this was the height of the AIDS epidemic. The produce was so fresh and exciting compared to the lackluster displays in stores at the time. Farmers could bring some very unique items to ever increasing, hungry customers. Knowing how good food was grown and meeting the people who grew it every week became so important for many people. This was so new then, something many of us take for granted now. We shop and trade at the market to put food on our table that we do not grow, too. The romantic view of our farming grew. I was once selling lavender at the Tuesday market and one desperately stressed customer said “I want your job.” I told her, “I do not have one as I work all the time.” “I still want it,” she insisted. I reminded her that I finished loading the truck at 11 pm, got four hours sleep, then headed for the market. As farmers, there is nothing better than the great feedback and appreciation we get from everyone. We work hard, take great financial risks, and then have a passionate customer willing to reward us with their hard earned cash. There are not too many of the original farmers still in the market. Change is good we need to make room for new blood. Farms must pass the baton to the next generation, too. It thrills me to see farmers’ sons and daughters already taking over some of the farms. For me, community is my joy. I am told I spend too much time talking and not enough time selling. The support given to me in my time of need was enough to make a grown man cry. Thank you all, from all the farmers, for a wonderful first 20 years.